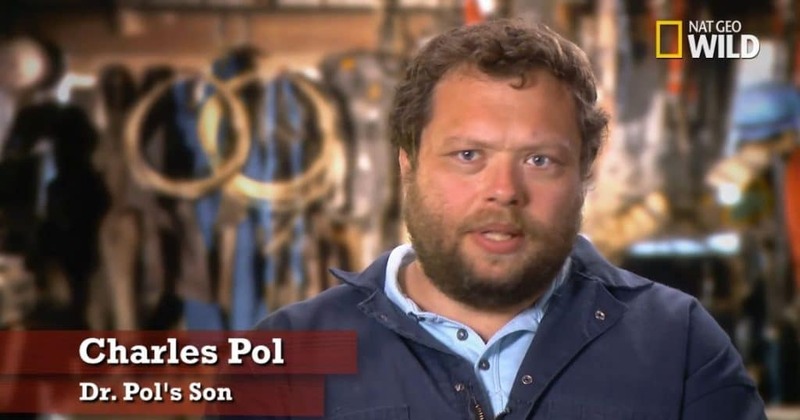 The famous Dr. Jan Pol and his wife Diane Pol didn’t have biological offsprings, thus, they adopted three, one of whom is Charles Pol and together, the members of the Pol family have been appearing on The Incredible Dr. Pol reality show since it first aired in 2011. Charles became his father’s sidekick when he was a little five-year-old, helping out with the animals on the farm. However, when he grew older and was faced with the big decision of choosing a career path, he chose a completely different route from his father’s. This didn’t stop his family from supporting him, in fact, his choice of career turned around to favor the Pols as Charles brought the idea of the reality show and currently plays a major role in the production. Here are the lesser-known facts about the reality TV star. He was born on the 6th of March 1979, in Central Michigan Farm County. Charles was adopted by Dr. Jan Pol, a Veterinarian, and his wife Diane Pol, shortly after his birth, thus, there is no information available about his biological parents. The good doctor and his wife also adopted two more kids – Kathy Pol who joined the family upon her birth and Diane Jr. who was already 18 by the time her adoption was completed. Charles Pol began helping out with the animals when he was still a child. He assisted his father at the clinic and was really helpful with farm calls, as well as looking after the pets and farm animals. At first, working with his father was everything to Charles but when he became older and had to choose which profession to focus on, being a veterinarian like his father didn’t entice him. He opted for a career in the entertainment industry, a decision his parents never opposed. To prep for his venture into the entertainment world, Charles studied Mass Communication/Media Studies at the University of Miami where he obtained a Bachelor of Science in 2003. prior to that, he studied an undisclosed course at Central Michigan University from 1998 to 2001. After his graduation, he moved to Los Angeles where he interned with industry big names like Paramount Pictures, as well as Mirage Enterprises. His main focus was in acting and production. During his internship, he was opportune to learn from late Sydney Pollack, one of the best in acting and movie production. Starting from 2004, right after graduating from College, Charles Pol explored the production part of films before the idea of a family show came into the picture and he pitched it to the National Geographic channel. Soon, The Incredible Dr. Pol show emerged in 2011 with Charles as one of the producers. Apart from working behind the cameras, Charles often plays a starring role on the show. Other cast members include Dr. Jan Pol, Diane Pol, Dr. Brenda Grettenberger and Dr. Emily Thomas. In addition to The Incredible Dr. Pol, Charles has worked on other shows including TV series The Legend of Sheriff Gus Skinner (2013) and Calling Dr. Pol (2014). His foray into the entertainment industry has not only made Charles and the rest of his family famous, but it also brought good fortune for him. As a producer and actor, he earns as much as $20,000 or more from The Incredible Dr.Pol. Added to his other endeavors, the reality TV star has built a net worth of $1 million. Like most public figures who don’t share every personal detail with fans, Charles has fallen victim to gay rumors once or twice. The claims which didn’t hold much water was shut down when he went public with the identity of the woman in his life. Subsequently, he has not spared any moment in sharing his memories with her on his social media accounts. Read Also: Jax Taylor – Biography, Age, Wiki, Net Worth, Is He Gay? Is He Married To A Wife Or Has A Girlfriend? Charles Pol and Beth Oakes took their childhood friendship to a different level in 2017 when they started dating. They also appeared as a couple in season 12 of The Incredible Dr. Pol, cementing their relationship status. In January 2018, Charles Pol put an engagement ring on Bath’s finger, sharing it on his Twitter handle. Accordingly, congratulatory messages poured in from his followers on the platform. The two had their wedding live on The Incredible Dr. Pol in January 2019.